You’ve read the comics. You’ve seen the AMC series. You’ve played the Telltale game. You’ve played the board games. You’ve donned the cosplay outfits. You’ve gotten the neck tattoos. You may have thought you’d experienced The Walking Dead in every way imaginable already, but you haven’t done this yet. This is Walking Dead margarine. No wait, it’s the franchise’s first foray into the world of mobile and tablet gaming, The Walking Dead: No Man’s Land. The debut teaser trailer can be seen above, courtesy of AMC, and it sadly doesn’t let us in on what kind of a game this will be. Other than one where zombies threaten the lives of everyone around, of course. While the Episode 4 SPOILERS are kept to a minimum, you’ll definitely want to play Episode 3 before reading. 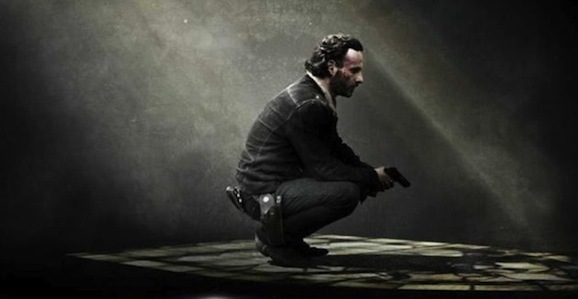 In the world of The Walking Dead, the only safety is in knowing that there is no safety. 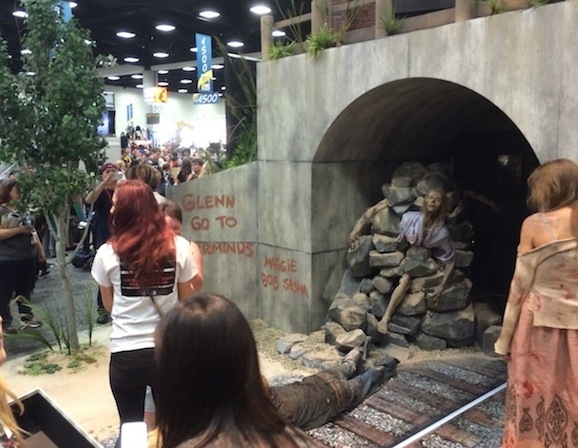 Undead walkers are around every corner and behind every door, just waiting to turn people’s faces into mulch. 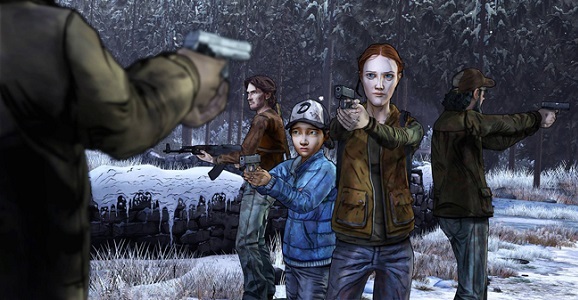 Yet Telltale’s The Walking Dead: The Game has consistently proven that humans are still capable of the most monstrous actions in this post-apocalyptic world, and Episode 4, Amid the Ruins, is a dark and dreary reminder of that fact. Complete with tons of gore, decision-making, and the brief potential for humane sympathy, of course. San Diego Comic-Con 2014 officially kicks off tomorrow with “Preview Night,” which used to just be an excuse to wander around the dealer’s floor before the hordes arrived, but now is the day you have to get in line if you want to get into Hall H. Of course, one of the many great things about Comic-Con is all the free swag you’ll have crammed into your bags during the flight home, swag such as these rather badass exclusive Con posters for AMC’s The Walking Dead and the upcoming Jurassic Park sequel, Jurassic World.